The Albin pallasite is characterized by very clear crystals of Olivine up to 3.7 cm across. Composition of Olivine (Fa12.5) and Fe-Ni metal (10.4% Ni places it within the Pallasite 'Main Group.' The Kamacite shows multiple Neumann bands indicative of major shock. 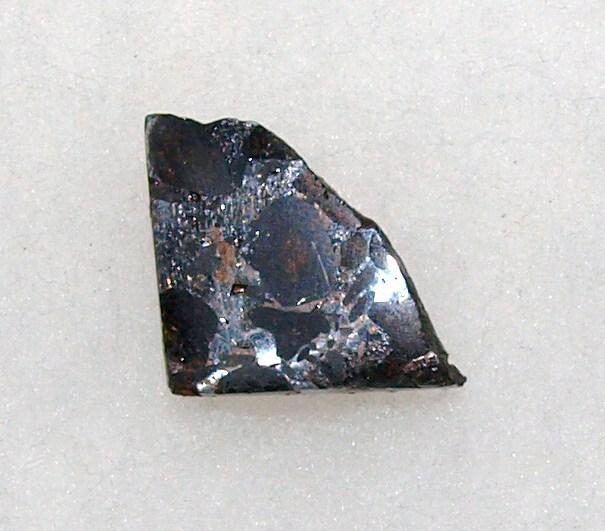 Chromite, especially, plus schreibersite and merrillite are found in most moderately large pallasites that have not experienced excessive weathering. All meteorites recognized by the Mineralogical Society are given unique names. 'Albin (pallasite)' is the proper name for the meteorite found in 1915; 'Albin (stone)' is the proper name for a 15.4 kg ordinary chondritic meteorite (L chondrite) found in Laramie County in 1949. American Mineralogist (1968): 53: 508. Buseck, P.R. (1977) Pallasite meteorites-mineralogy, petrology, and geochemistry. Geochim Cosmochim Acta: 41: 711-740. Jijin Yang, Joseph I. Goldstein & Edward R. D. Scott (2010) Main-group pallasites: Thermal history, relationship to IIIA irons and origin. Geochimica et Cosmochimica Acta: 74: 4471-4492.